STEAM EXPO (science, technology, engineering, art, math) is an event designed to encourage interaction and collaboration between students and community professionals. The purpose is to apply knowledge and understanding of science, technology, engineering, art, and math to conduct in-depth “real-world” investigations. The process includes mentorships, demonstrations of classroom science explorations, and extensions of the inquiry process posed in youth note-booking journals. The exhibition itself allows students to demonstrate the results of their STEAM studies, professionals to show how STEAM is used to better our communities, and spectators to participate in the event. The STEAM EXPO event will connect our youth to the community, professionals, and generate interest and excitement for science, technology, engineering, art, and mathematics. 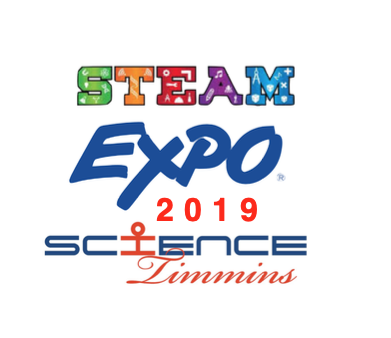 Science Timmins will host the STEAM Expo 2019 for northeastern Ontario region, from March 28th to 30th at the Science Village at 225 Fifth Avenue, Science Village Lane in Timmins, ON. This year promises to be a terrific expo in the areas of Science, Technology, Engineering, Arts and Mathematics. STEAM Expo 2019 will provide youth in grades K-12 with an opportunity to pursue their learning interests and showcase their creative research, design, building, and problem-solving projects. Every year our youth produce an abundance of genuinely intriguing and informative projects and presentations covering different STEAM components. STEAM Expo 2019 will also provide an opportunity for related industry, businesses, university/college faculties, and professional organizations to share their expertise and STEAM passions with the community. The K to 6 component of STEAM Expo is non-competitive and encourages student participation and sharing. The event is an opportunity for our younger students to share their enthusiasm for Science, Technology, Engineering, Arts and Mathematics. Participants from grades 7-12 of TIMMINS STEAM Expo will have their projects evaluated by a panel of judges from the community. All projects will be open for public viewing. Winners in various categories and grade divisions may represent Timmins at the Canada- Wide Science Fair in Fredericton, New-Brunswick in May 2019. Human-centered design shows youth STEM can change the world!